*I draw and paint with my finger on the screen, rather than use a stylus. This drawing began as a quick sketch using a black “inktense” pencil. 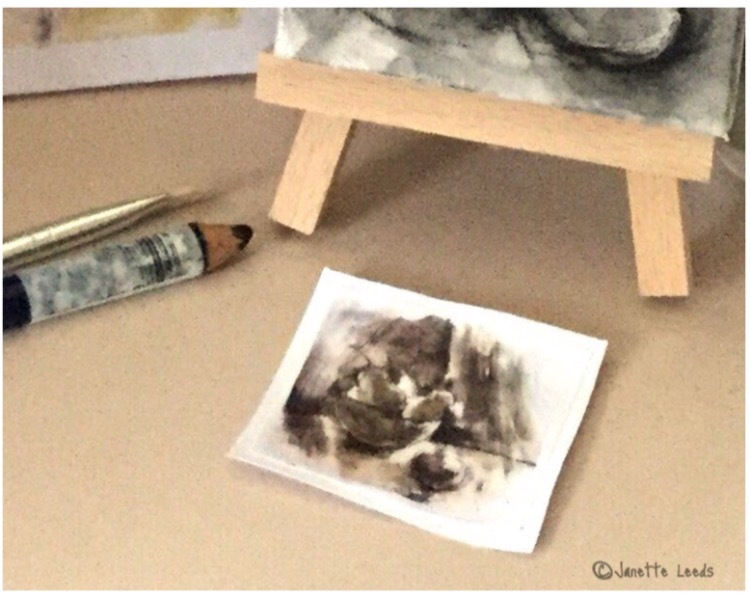 With a wet brush, I swished over it – turning it into lovely inky wash. There’s a photo here, of a tiny print version of this drawing; taken from a larger photo of some of my other prints, which I shared in a recent post. *Pics of the processes are further along. A print of my pencil drawing. Since then, I’ve added colour to the scanned in drawing in the “Art Set Pro” app. Then I took it into the “TypeDrawing” app and added my haiku – making it into a ”haiga” or in other words, an illustrated haiku. I also put a grey border on it in the “Pic Collage” app. This is one I did along the way; wasn’t quite happy with it. I used “alliteration” in this haiku; one of my favourite poetic devices…though it can be easily overused! 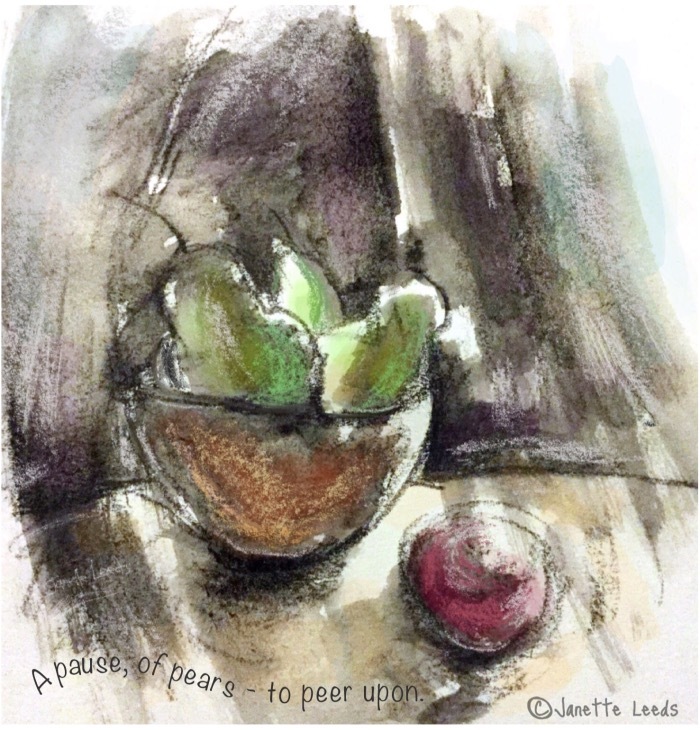 I continue my interest in “pears” as a subject matter, and word play. Here’s a link to a post from earlier this year, on these areas and also my post called “About Haiku and Tips on Writing Them”. Since, during and before – my more formal years of art and english studies; I’ve filled numerous sketch books with my art, scribbly notes and various writings. I find blogging is another great way to keep a record of my art and words. *Tap on a pic to enlarge them all. A quick sketch using a black “Inktense” pencil. Running a wet brush over the inktense pencil sketch was fun! An enlarged section in “Art Set Pro” app. Love how the scan picked up the grainy paper texture. An added benefit, is I can offer some information and ideas, which I hope to be helpful, for your own art and writing journey. Creating posts certainly gives me more incentive to organise my: processes, ideas and finished works, into polished and presentable formats. One day I hope to publish some of my blog into a book – what fun! The Write Life – for blog and book self publishing.